Silver coins feature high-purity silver content as well as a face value in their nation of origin. We offer a wide selection of Silver Eagles, Silver Maples, and other foreign coins. Far and away, the most widely recognized and acclaimed silver coin is the American Silver Eagle. Produced by the U.S. mint, this stunning coin is symbolic of high quality silver bullion production and heritage. The American silver eagle carries a face value of $1.00 and is .999 percent fine. Most commonly bought and sold silver coins contain 1 troy ounce and are also .999 while some can be as high as .9999. Though one ounce is the most popular size, some coins are produced in sizes of 2 oz, 5 oz, 10 oz and even Kilogram in some cases. Junk silver is another option for investors. Junk silver coins are circulated coins that contain up to 90 percent silver. For example, silver dollars minted in the U.S. prior to 1965 contained silver. It is more difficult to determine the actual amount of silver in such coins, although they are considered to be another inexpensive and cost effective way to begin acquiring physical silver. Commemorative silver coins are also produced in various sizes. A commemorative silver coin is produced in limited quantities and can have varying amounts of silver. These coins are considered to be more of a numismatic, or collector’s coin. Silver coins are often bought and sold in uncirculated condition. This means that the coin has never been in circulation, or handled as currency. In addition, one can purchase silver proof coins. Proof coins, unlike regular coins, have been struck multiple times giving them a very unique shine and luster. Like most other bullion products, silver coins can have a wide range of premiums attached to them which varies from coin to coin. For many silver coins, this premium may only be a couple dollars over the current spot silver price. For other coins, the premium may be as high as ten or twenty dollars over spot. Proof coins are the most expensive because of their brilliant, uncirculated condition and luster. It is not at all uncommon for silver proof coins to cost fifty or even hundreds of dollars over the spot silver price. Obviously, supply and demand play a role in silver coin prices. The more rare or brilliant a coin may be, the higher the premium it may command. 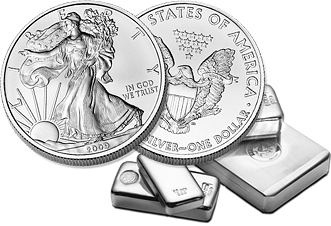 Silver bullion coins are one of the most liquid and efficient bullion investments one can make. The relatively small premiums on most coins make silver coins a cost-effective way to add to physical bullion holdings. Because these coins are traded and recognized around the world, they are very liquid and easily transacted. In addition, because the coins are small they can be stored in secure vaults, safety deposit boxes or in secure locations at home. They are also easily stacked. One may also want to keep in mind the fact that not only is silver potentially a very useful investment, but that it is also very important in modern industry. Because of the metal’s unique properties, it has many uses, and demand has remained strong for silver. This could be just another reason to perhaps consider silver coins for investment purposes.